Condolence to Ate Sol Pillas, the Secretary General of Migrante International! Her courage, passion and selflesness will always lead me on the way of movements and revolution. It is with great sadness that Migrante International announces the passing of Sol Pillas, friend, comrade and warrior for the promotion and protection of migrants’ rights. Pillas passed away today, April 21, at 5:30am, seven months after suffering a massive stroke last September 2015. She was 58 years old. 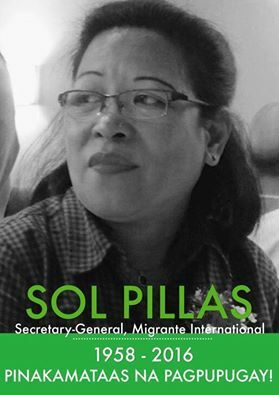 Migrante International extends its most heartfelt condolences to Pillas’ family who have since embraced her activism, friends, colleagues and comrades, and the international community of human rights workers and migrants’ rights advocates that she served and upheld. At the time of her death, Pillas was the Secretary-General of Migrante International, the largest global alliance of overseas Filipinos and their families. Pillas was a domestic worker in Hong Kong for 25 years. Her activism started when she became a volunteer counselor and case officer of the Mission for Migrant Workers (MFMW) and the the Bethune House Migrant Women’s Refuge. Why do we need to go to MECO on Dec. 18? Why I can’t forward KMP’s FaceBook link on FaceBook? Is there a ban on it?